A cultivar of Camellia japonica L. ‘The flowers are of a fine dark rose red colour, irregularly blotched with white; whilst those which appear in the spring are generally plain red. They are three or four inches in expansion. When the flowers are fully expanded they become recurved. The centre petals are often small, narrow and upright, confusedly arranged, many of them being disposed in tufts, with small parcels of stamina intermixed. Some flowers are particularly handsome and as double as a rose.’ [Don]. 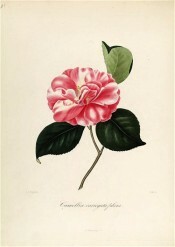 ‘This was one of the first of the Double Camellias seen in this country. It was brought from China sometime about the year 1792. […] It is a most abundant flowering sort, and possesses the peculiar property of flowering differently at different seasons. If the blossoms open in the autumn (which by keeping the plants warm in the spring, and forwarding their growth they will do) they usually are most elegantly variegated: on the contrary, if kept cool and backward, so as to flower in the spring, they come out almost, or quite plain red.’ [LBC no.329/1819]. It was probably first figured in Andrews’ Botanical Repository in 1800. [ABR pl.91/1800]. Berlèse Iconographie vol.I pl.20/1841. Chandler pl.6/1831. The plate in Chandler appears more stylized, the flower a very bright cherry red with large white blotches. Introduced to England by Captain Conner. [Berlèse Monography p.103/1838]. Listed in all published catalogues [T.267/1843]. Probably obtained from Loddiges’ Nursery. It was named variegata pleno in both the 1830 and 1836 Loddiges’ catalogues held at Camden Park and marked with a ‘c’, denoting grown at Camden, in the latter [CPA]. Variegata was also marked ‘+ C’ in an article by ‘G.A.L’ in the Horticultural Register. Although this book originally belonged to James Bowman, it is likely that it was grown by the Macarthur family earlier than 1843. The code ‘+ c’ denotes grown at Camden but not new to the colony. [HR p.633/1832]. A plant was presented to the Sydney Botanic Garden on December 24th 1845 [RBGS AB]. ‘Variegata’ was among the camellias positively identified at Camden Park by Walter Hazlewood in the 1930’s. He described it then as ‘bright red, sometimes marbled white, semi-double, bunch of stamens in centre.’ [TJSC].